The Greenwich Peninsula Low Carbon Energy Centre is the largest new build residential heat network in Europe, saving over 20,000 tonnes of carbon every year. As the SSDA awards celebrate their 50th year of recognising the best of what the UK steel construction industry can achieve, we celebrate that 77% of the projects feature STRUMIS customers. In this post we will be celebrating Billington Structures Ltd.’s involvement in the Greenwich Peninsula Low Carbon Energy Centre project. From conception, the energy centre project was developed with innovation and creativity as a central theme. An important part of the structure is the highly distinctive flue tower, measuring 3m x 18m on plan and 49m tall, which houses the equipment serving technically advanced boilers capable of heating the thousands of new homes and businesses in the North Greenwich peninsula. 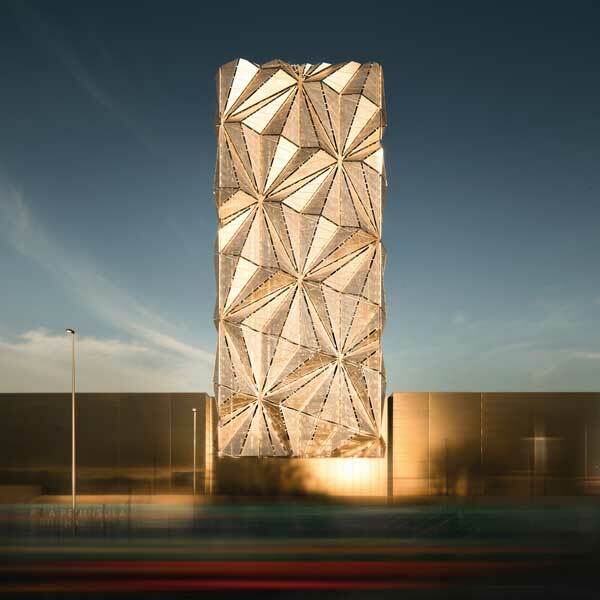 The cladding of the 49m-high stack tower unites sophisticated engineering and complex optic research to create an impressive sculptural concept on a huge scale. The unique cladding is formed of hundreds of triangular panels – each the height of a London bus – that fold and flow across the surface of the tower. Price & Myers designed the main building and tower to be structurally independent, to avoid the effects of cyclic loading and fatigue on the tower affecting the main building. The flue tower is formed from five 49m tall latticed girders, connected by a series of raking beams and bracing on the main east and west façades. A total of 345t of galvanized steel was erected for the flue tower, which consisted of five main cantilever frames, each formed from three 16m high by 3.15m wide sections spliced at third points on-site and placed 4.5m apart. These were connected together with interleaving diagonal secondary members fixed to both chords. The prefabricated trussed girder sections were the largest frames ever to be hot-dip galvanized by Worksop Galvanizing. The frames were double-dipped corner to corner in a zinc bath with only millimetres to spare at each end. Bespoke lifting brackets were designed and supplied by Billington to allow accurate control by the galvanizers during lifting and turning for the second dip.